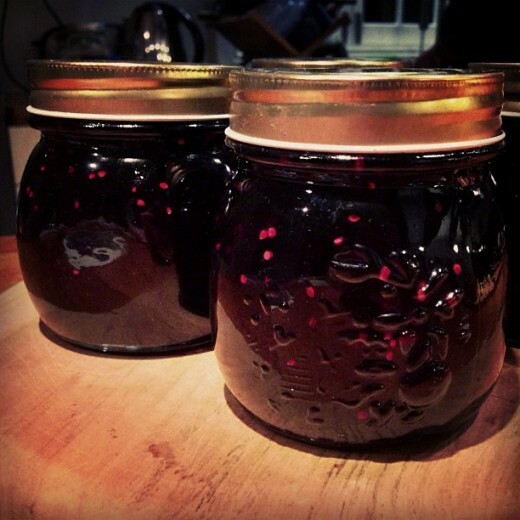 Making homemade mulberry jam is simple. The hardest part is waiting for the berries to cook! In fact, you can use these basic guidelines for any type of berries, and make any kind of jam you want. Use any quantity of berries, but a large batch (a gallon or more) will be more worth your time. Mulberries, or other berries or fruits. Good candidates include blueberries, raspberries, blackberries, or even combinations of fruits like strawberries and rhubarb. Use whatever appeals to your and your family. 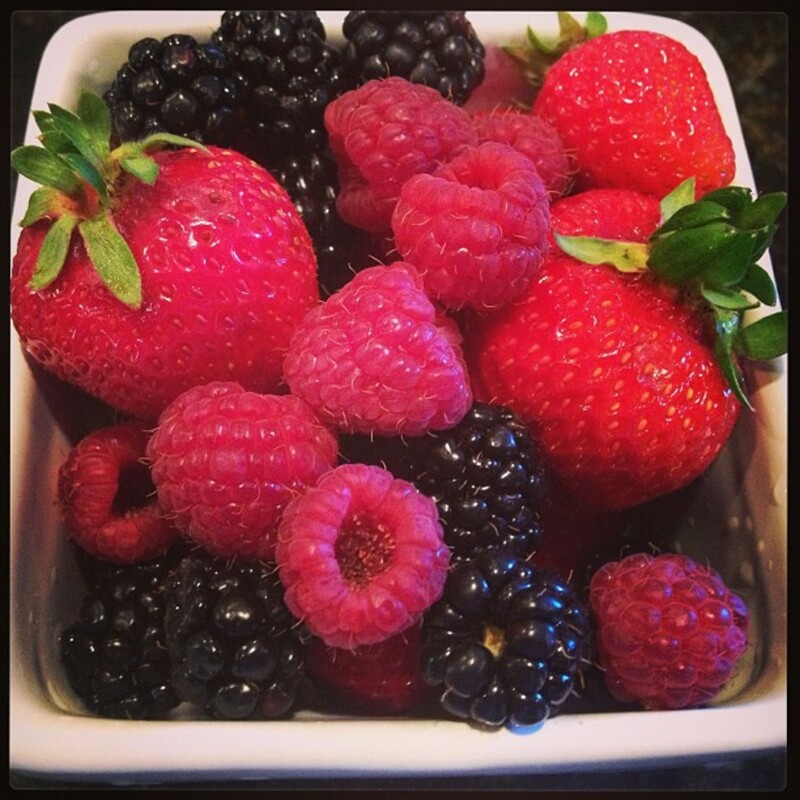 When you harvest your berries, avoid crushing them by placing them in shallow containers. You will need to sort them if they have just come directly off a tree. Wearing thin rubber gloves is a good idea, as mulberries stain easily! If you don't wear gloves, you will have purple hands for several days. My husband has fond memories from junior high school of showing one girl how much he liked her by rubbing handfuls of mulberries in her hair. That was before hair dyed all sorts of unnatural colors came into vogue. It is unclear to me whether she continued to like him back. 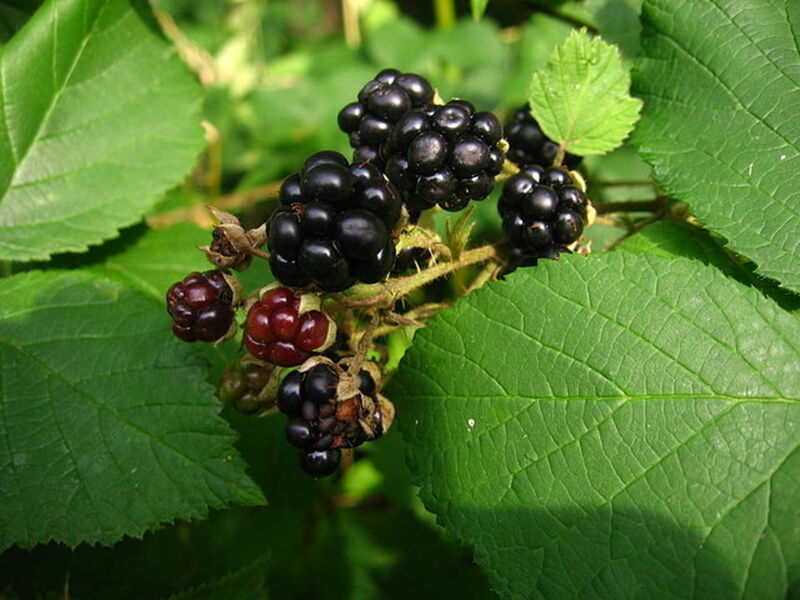 Begin by taking out all sticks, leaves, and unripe, pink berries which are quite tart and can make you sick. 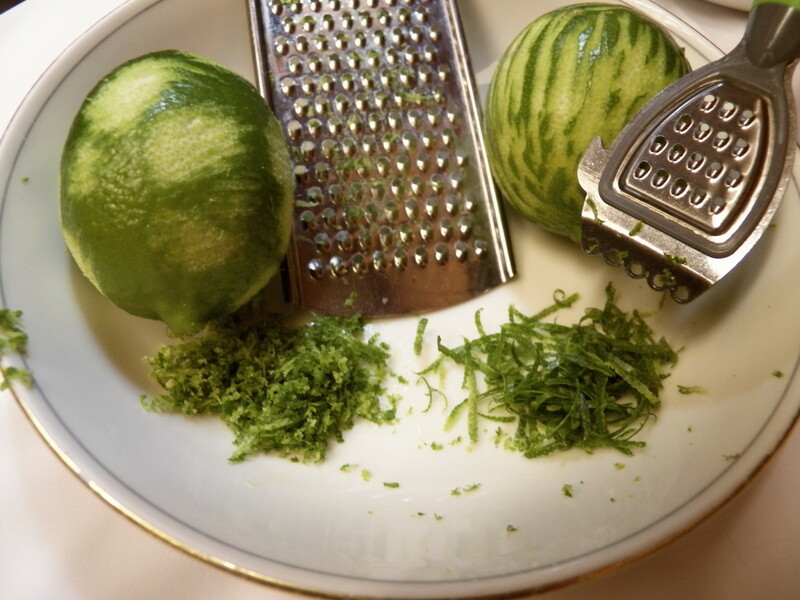 A few unripe ones in the pot won't spoil the jam, but don't let too many slip by. This is the most labor-intensive part of the process. Wash your berries. 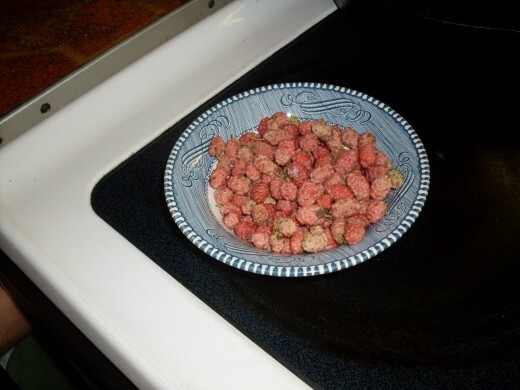 You may float them in a clean sinkful of water and scoop them out into a colander to dry, or you may use a wire colander or sieve and run water over them. Wash them gently, so as not to crush them and release the juices. When you have removed everything you don't want to eat, you are ready to start jamming. Sort the berries, taking out any sticks, leaves, and pink, unripe berries. Here are sour, unripe berries. My kids like them but some people say they can make you sick, mentally and physically, so you'd best discard them. They will do fine in a composting pile...or wait for them to ripen, and use them. Cooking the berries down is hardly any work at all. Just turn the heat on low at first, cover the pot, and go do something else, coming back occasionally to stir and see whether you need to adjust the heat. As more juice is released, you should increase the heat and stir more frequently. You may add sugar at the beginning, if you like. I add a little, just to thicken the juice into a light syrup. 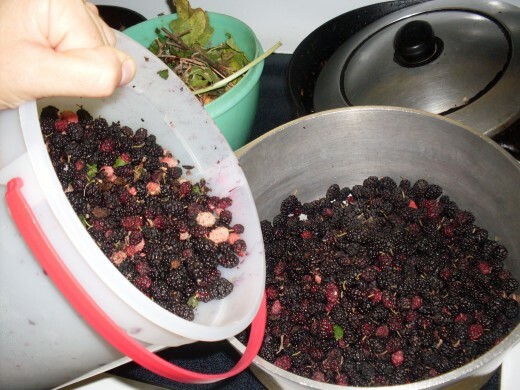 A rule of thumb for jams is to measure your fruit and add half of whatever that quantity is in sugar, but ripe mulberries are quite sweet on their own, so this proportion of sugar will be overwhelming. Use discretion. You may add pectin if you desire a thicker jam. Pectin is sold as powder or as a liquid, or you may make your own from sour apples (I usually just chop a few small peeled and cored apples into the jam and allow them to cook down together. Tart applesauce should work as well). When the berries are a bit bubbly and have released their juices, they are just about done. 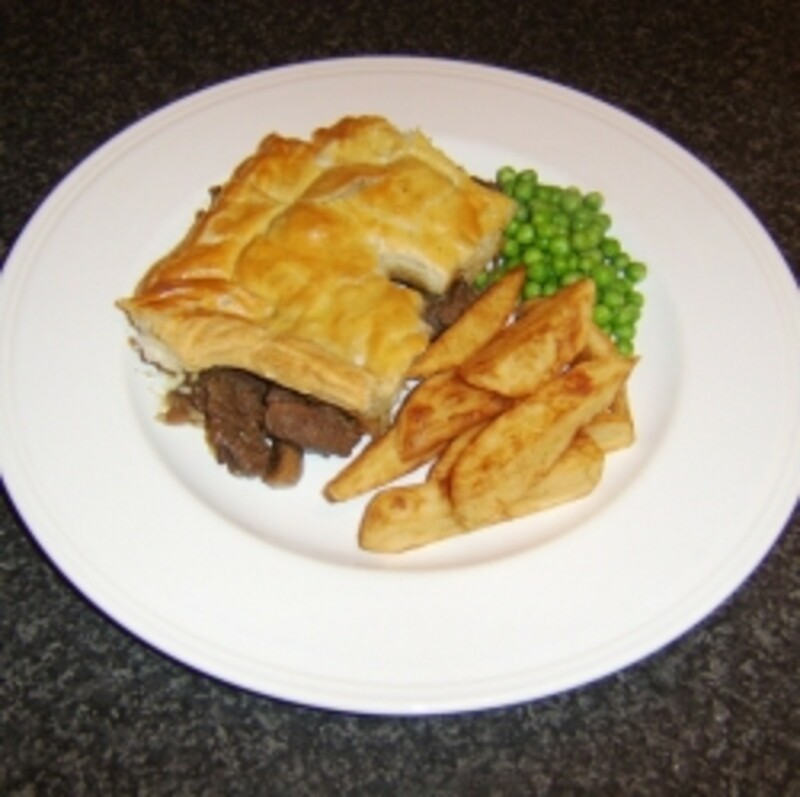 You can allow them to cook down and thicken a bit more (supposing you have added sugar and/or pectin), or you can take them as is. I usually don't have berries in sufficient quantities to make it worth my while canning them, but you may use a water bath canning method, if you like (see below). I prefer to spoon my jam into small freezer cups, such as recycled yogurt cartons, and have them ready to thaw as needed. Be sure to label carefully. The berries will cook down slowly in their own juices, if you cover them tightly. When they are a bit pulpy (not shapeless and totally mushy), they are ready. Mulberry juice stains! It will stain your utensils, clothes, and hands. 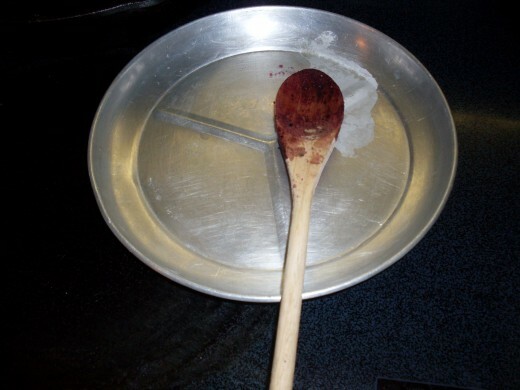 Wash your jars, self-sealing lids, and rings, set your lids in scalding water, and fill your waterbath canner with the appropriate amount of water, aiming to cover the jars by about 1 inch. (You may use any size or style of jars that appeals to you, provided they are true canning jars.) Begin heating the canner. 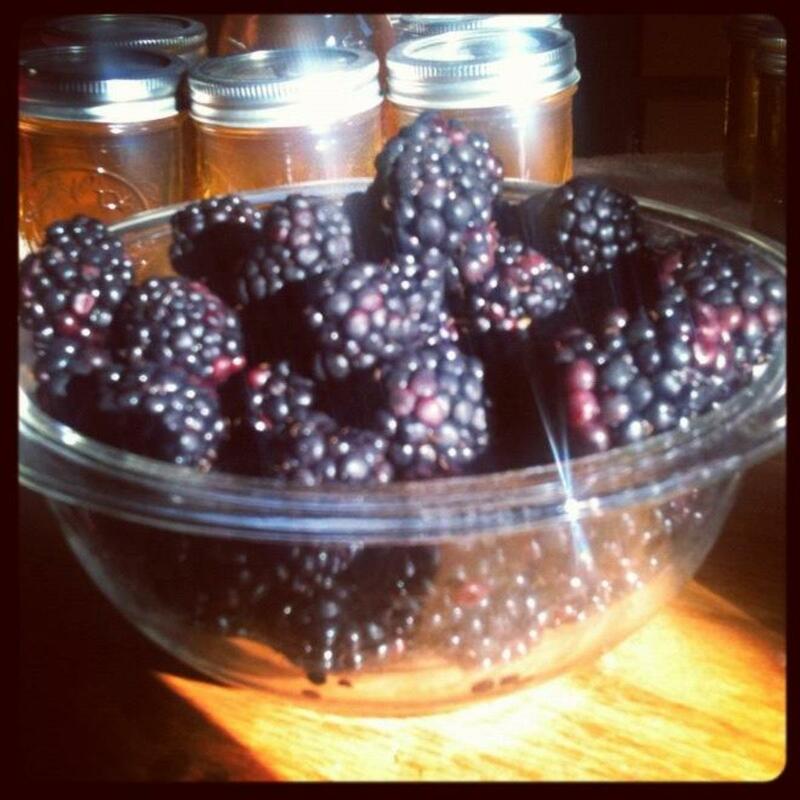 After your berries have cooked down, ladle the jam into the hot jars, leaving 1/4-inch headspace. Wipe the rims of your jars with a clean, damp cloth, then put on the lids, being careful to get the rings tight, but not overtight, and place carefully in your canner. Once the water boils, begin processing time. Process pints 15 minutes. Remove jars to a clean, dry towel, set away from drafts, and leave to cool for 8-12 hours. Check seals, wash the outsides of the jars if necessary, and store in a cool, dark place. Jars of jam make lovely gifts. Don't forget to make neat, professional-looking labels and tie them with ribbon or raffia. Yes, this is a simple jam process that can be used with other fruits. Use sugar or other sweetener to taste. Liquid sweeteners will make your jam thinner, of course. Berries, crushed stone fruits (peaches, plums, etc. 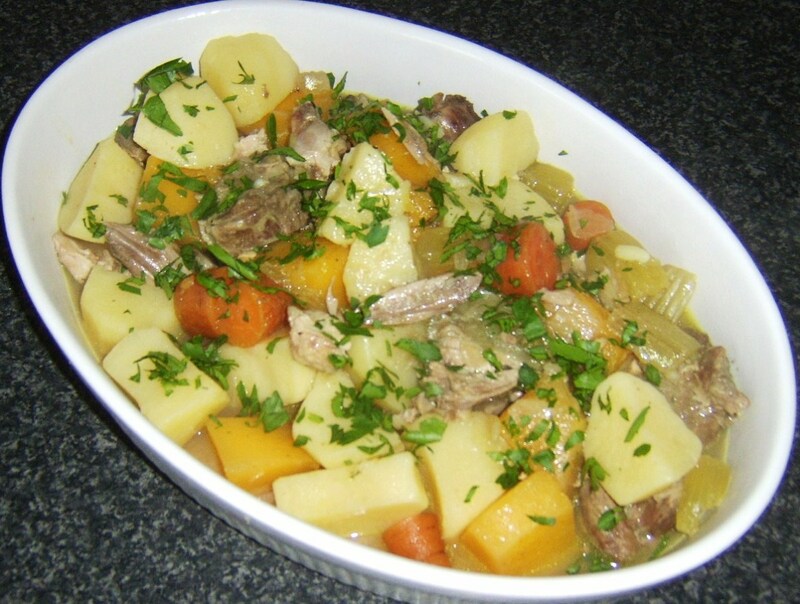 ), and some tropical fruits are good candidates for this recipe. Use singly or in any combination of fruits you prefer. Can I replace it with other Fruits? You can skip the pectin if you don't care about the jam being a little runny, or sauce-like. Pectin causes fruit juice to gel. Adding apples or citrus (including peel) will provide natural pectin, as when making marmalades, but will drastically alter the flavor of your product. You may use any sweetener you prefer, and in any amount, provided you don't care about the sugar helping the jam "set up" or gel. I often cut the sugar in recipes by half or more, so long as I don't require it for texture. Stevia granules or leaves, honey, etc. are acceptable alternatives...but sugar is cheap. If you have a beekeeping friend, ask him where he gets his winter feed supply of sugar. He may know a bulk source which will cut your costs. 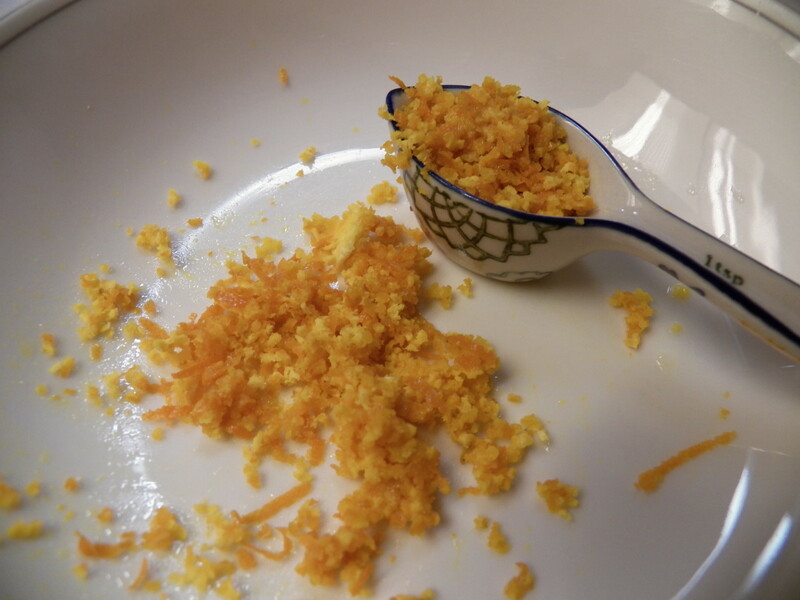 It was a good one, but in place of pectin or sugar what else can be used? 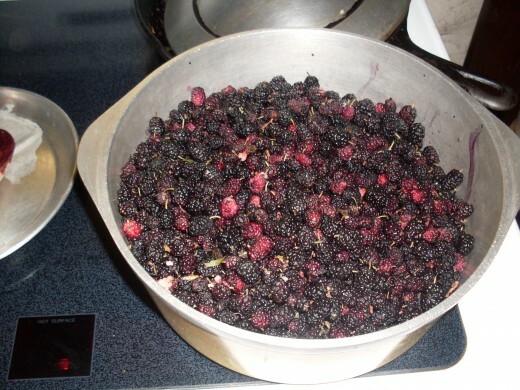 I usually use some 18 cups of mulberries because we always have a bumper stock in summer. So can you suggest something else to put instead of pectin or sugar? We can't buy so much pectin every year. Can you suggest something more cheaper? These came from a friend's tree, which I never saw; I couldn't say about the strength of the branches. You are right about the flavor - it can be dull. What a good idea about the drink mix! The truth is, I was in a hurry when I did this batch, and figured the critters who dig in my compost pile could have the unripe berries. Let the unripe berries ripen a few more days, and sort again. No need to throw those away. I am very doubtful that they are harmful, but who would want to eat them. Your tree must not have strong stems on the berries, as I usually don't have nearly that many unripe ones. I usually find mulberry jam not flavorful enough for me. My Mom used an envelope of unsweetened drink mix, like Kool Aid, to flavor; some compatable flavor. I follow the recipe on the pectin box otherwise. some reports say that underripe mulberries can be mildly hallucinogenic. I have it on very good authority that no matter how many of those underripe berries you eat, you will not have troubles. 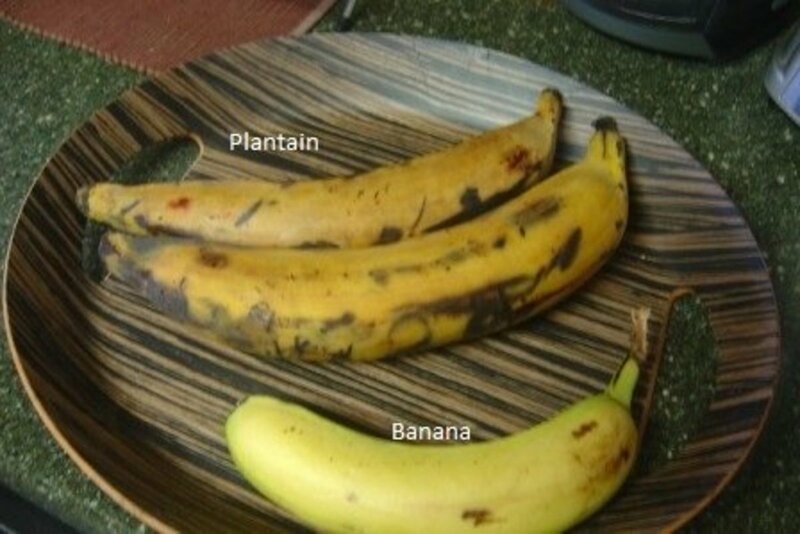 I've also eaten both the ripe and unripe all my life with no troubles. Just FYI, if I get a few underripe in my jam, I don't stress about it at all. Suggestion Two - Add a bit of plain gelatin, heating to dissolve it in the jelly, then letting it set back up. This might give it too much shape/stiffness, however, depending on just how flexible you need the jelly to be. A third suggestion is to add more sugar, as sugar will give jelly more body, but this would alter the taste with which you are already satisfied. Deb, I hope it turns out great! i making now will c how i go? Will keep informd! i will cook mulberries down for the first time & i was wondering if they cook off the stem & you discard this and just use the juice? and at what time do you do this? thanx! Treetop, I don't use pectin in this jam. If cooked down enough, it's stiff enough to pile onto a piece of bread without trouble, on it's own. 18 cups of fruit is a lot, but should be very doable in one batch, providing you're willing to stir frequently and thoroughly, to keep the jam from sticking to the bottom of the pot. As mentioned in the article, mulberries don't need much sugar, as they are typically quite sweet on their own. However, you will want to add some sugar, to help them thicken and to improve the texture of the jam. According to a typical jam recipe, you should add 9 cups of sugar to your 18 cup batch of berries. However, this is probably excessive for such sweet mulberries. I would start with 4 or 5 cups of sugar, and go from there, adding to suit your taste. Wait a few minutes between additions, to give the sugar time to work on the berries. The more sugar you add, the thicker and more syrupy the berries will become, and the more juice you will draw out of them. So just experiment, until you are happy with your batch, then write down your findings for next time. Share them here, if you like. Smurfette, I haven't done berries since last summer, but if my memory serves me, it took roughly forty-five minutes to cook this batch down (very slowly, stirring often). The idea is to get them thick enough to handle easily and pile well on bread/waffles/etc. If you like them more syrupy, less time will be involved. It's really a matter of taste. Fastfreta, I'm so glad you dropped by! I've been up to my ears in canning this season...I have many more food preservation hubs sitting in half-done drafts because I've been too busy canning to write! Someday I'll get back over and read more of your hubs. My garden is slowing down some so that looks like a possibility. Your hubs are most enjoyable. WOW, this is an interesting hub. I never knew that the pink mulberries could make you sick. That's why it's good to read all the hubs completely. Thank you very much for sharing. My mother can identify with you on your canning venture. I've never canned or desired to, however it does look like fun. Chit! I cut my mulberry tree down this spring and it was in the first time fruit! I wanted it off the property line and dint notice the fruit until it was too late.